Often golfers can be heading for a good score and then one bad golf shot can set off a chain reaction of bad golf shots. This is a very common problem and there are many things you can do to prevent this from happening. The one biggest thing I think is to have a pre-shot routine and then stick to it no matter what. Now this takes discipline to do and it can be very difficult at times, but you simply must do it if you are ever going to beat this thing. Now your pre-shot routine must be very precise. You don’t have to be so precise that it goes for a certain length of time but you do have to do the same movements over and over again. So that’s one thing you can do to really beat this problem. I believe that after every golf shot you hit that isn’t up to your potential (and with the game of golf that will be most of them) you should take a moment to shut your eyes and visualize how you would’ve liked to have played that shot. You see, most people play a bad shot once and then replay that bad shot over and over again in their mind. You’ve got to stop this from happening because the more you focus on something the more you’re going to get it. So immediately after any bad shot simply take a few deep breathes and close your eyes and visualize that shot again, how you would’ve liked to play it. After you’ve done this don’t rush to the next shot, take your time. And here’s a suggestion of what you can do before you play the next shot. Take out a club and shut your eyes and have a few swings just concentrating on the feel of the clubhead. Let the clubhead control the swing, not you. Also have a few swings while gently humming to yourself trying to maintain a quiet tone. And if you are swinging too fast or you’re not swinging with any rhythm then your humming will speed up and this will give you great feedback as to how your tempo is. Simply keep swinging and concentrate on your tempo so that your hum stays at a constant pitch throughout your swing. This is also a good practice technique that you can do when hitting golf balls. Of course you wouldn’t, so why would you accept thoughts like that from yourself? You shouldn’t. After a bad shot simply accept it and move on. Hey, everyone has bad shots, golf is a game of mistakes. The better golfers simply learn not to let one bad shot turn into two, then three, then four. And to stop this rut you’ve got to notice how you’re moving your body, how you’re talking to yourself etc, etc. Now what most people do when they play a bad shot is they speed up, so be especially weary of this. Slow down. Change the pace of your walk. In short do something different until you get back into your natural rhythm again. Do these techniques and you’ll find your bad shots won’t lead to more bad shots, but if you don’t do these techniques then you’ll always have a big disaster regularly. The choice is now yours! The actual golf grips on your golf clubs have a big influence over the golf shots you hit consistently. For example, if you have a slice problem your golf grips could be encouraging that ball flight. 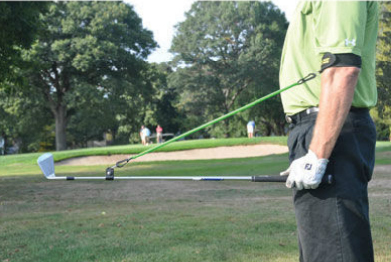 Equally, if you have a hook problem your golf grips could be encouraging that ball flight. So in this article I’m going to show you how to test your current golf grips to see if they are best suited to you and what you can do if they’re not. Now if you search golf grips you’ll quickly see that golf grips come in many different shapes, styles and even colours. But there is one big factor that has the biggest impact on the type of golf shots you hit consistently and that factor is the size of your golf grip. You see, if your golf grips are too thick of you then you’ll find it easier to hit a fade/slice. Conversely if your grips are too thin for you then you’ll find it easier to hit a draw/hook. So if your bad shot is a slice you should have a thinner grip than a thicker one. Here is a great way to tell if your golf grip is too think or too thin for you. Simply grip the golf club with your just your left hand and then pick up the golf club and look at the middle fingers of your left hand. Now here is how you can tell if the grip sizes are correct for you. If the tips of your middles fingers on your left hand are just touching the pad of your palm then that indicates that the grip thickness is fine for you. If the tips of your middle fingers on your left hand are quite a bit away from the pad of your palm of your left hand then that indicates that your grips are too big for you. If the tips of your middle fingers on your left hand are digging into the pad of your left hand then that indicates that your grips are probably too small for your hands. I highly recommend that you go through and do this golf grip test on all of your golf clubs now. If after you do this you find that your grips are either too small or too big then I suggest you get your grips changed. If they are too thin you can simply get wraps put under your grips to thicken them up. Or if your grips are too thin you can get thinner grips. Just experiment with one of your golf clubs to see what works best for you as far as your golf grips are concerned. A simple change to you golf grips can really have a big impact on your ball striking. After years of working with golfers I know that most golfers swing back too flat on the backswing and come down too steeply on the downswing. Just like the golfer in that video. And it generally takes golfers a lot of hard work to fix their swing plane. So to see that golfer make a big improvement to their golf swing so quickly is very, very impressive. Because of this I got this Perfect Release product so I could test it out for myself. When it arrived I found it very easy to setup. To set it up you have an arm band which you attach to your lead arm just above the elbow. This is good because both a right hand or a left hander can use it equally as well. Then you have a clip which you attach to the golf club about 8 inches from the club head. Once you have done this then you attach the cord to both ends. This comes standard with a green cord but you can also get a yellow cord that has more tension in it. I first started using the training aid with my driver and using the green cord. And I was very impressed with it because it helps to guide you through a great golf swing, IF you keep your grip relaxed. If you grip hard and try to manipulate the golf club then you can still get into some bad swing positions. But again, that’s very hard to do. After spending some time swinging my driver with the green cord I thought I would try it with my 9-iron. When I did this I found that I just couldn’t get enough tension in the cord like I could with my driver. So I swapped over to using the yellow cord because that has more tension in it, and that fixed that problem. Fixes the over the top swing problem FAST! When I first put it on my driver and was swinging with it for a while I then swung my driver without it on and the driver felt really heavy. I did not like that feeling at all. But within about 10 swings my old feeling was back so I don’t think it was a big deal. And I’ve never had that same sensation using it with irons so I’m not sure what that’s all about. So apart from that I can’t recommend this product highly enough. In fact, I was so impressed with it I asked the creator if I could sell it and he agreed. You can get it here on special. A lot of golfers suffer from a slice problem and the main reason is because of the golf grip they use. More specifically the left hand for right hand golfers tends to be placed on the grip incorrectly which means the right hand will be in correct. So in this article I’m going to walk you through gripping the club correctly with your left hand so you can hit powerful golf shots. First of all, when you’re practicing your golf grip you should do so with the ball in the middle of your stance and your feet together. This will help you to practice your grip on a daily basis so you get it in the same place day after day. Ok, so you’re now ready to place your left hand on the grip. To do this make sure the back of your left hand is pointing directly at your target and then place the grip so that it is running across the top joint of your forefinger and under the heel of your palm. After you have the club placed in this position of your left hand you then simply need to crook your forefinger around the shaft. 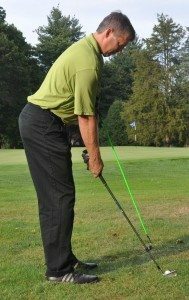 A good test to make sure you are doing this correctly is that you should be able to raise the club up off the ground and maintain a firm and solid grip with just your forefinger and the pad of your left hand palm. Once you can do this then lower the club back down to the ground and then close the last three fingers of your left hand around the club. Then you need to place your left hand thumb on the grip. To do this you should place your left thumb just to the right side of the front of the golf grip. When you do this a V will be made between your thumb and your index finger. Your left-hand thumb should be put in a position just to the right side of the front of the grip. Doing this will cause a V to be formed through the line between the thumb and your index finger. A lot of golf instructors say that you should be concerned where this V is pointing but that is very hard to tell when you are setting up to a golf ball. So here’s what you should be more concerned about. When you look down on your completed left hand grip you should be very aware of how many knuckles you can see on your left hand grip. And if you suffer from a slice problem then you should adjust your left hand grip so you can see 3 to 4 knuckles on your left hand. If you suffer with a hook problem you should experiment with a 1-2 knuckle left hand grip. Ok, so that’s how you should pace your left hand on the grip for more powerful golf shots. You right hand should be placed on the club to simply compliment your left hand. But if you get your left hand right you will notice a big improvement in your golf shot power. If you suffer from any of these problems then you’re going to want to read carefully what I have to say. Because I have found one of the quickest and easiest ways to fix an over the top swing problem. OK, a pretty impressive swing improvement right? And I guess you now want to know what that swing device is that was used by that golfer in that video. Well, it’s called the Perfect Release. I have been using this device for a while now and have found it to be awesome. I am going to do a full-on review of it, but this is such a great product that I didn’t want you to wait until my review for you to get the benefits of using it. The Perfect Release can be used with two different cords. The default cord that you get when you order is the green cord. There also is a yellow cord you can get that provides more tension and this helps to train you to swing faster. 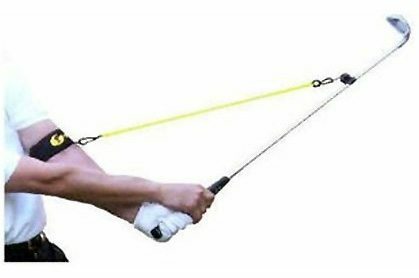 When I got this to test it out I got the yellow cord as well, and I highly recommend you do the same because it really is good for helping you to swing faster so you can hit longer golf shots. Because I have been so impressed with this product I have requested and been approved to sell it. And I have arranged the following two special ordering options for you to choose from..
To get the Perfect Release now with the green band it’s just $49.99 plus $14.95 shipping and handling. The normal retail price on this is $59.99 plus shipping and handling. So simply click the add to cart button below to order this now at the discounted price. To get the Perfect Release now with the green cord PLUS the yellow cord it’s just $59.99 plus $14.95 shipping and handling. The normal retail price on this option is $69.99 plus shipping and handling. So simply click the add to cart button below to order this now at the discounted price. After your order has been successfully processed we’ll get the Perfect Release to you ASAP! Not Enough Talent To Break 80? – Listen To This Interview! Make sure you listen to this interview below because it has the potential to radically change your perspective on golf and success. It’s an interview with Matthew Syed who was the number one table tennis player in the United Kingdom for a period of ten years and was the Commonwealth champion three times. He is also an award-winning sports journalist. This interview was conducted by John Richardson from the Break Par Bluprint. This interview extends WAY beyond golf but there are some real gems in there that you can apply immediately to your game and practice routines. If you would prefer to read this interview simply click here to download the PDF transcript. For immediate access to the Break Par Blueprint where we apply many of these principles to YOUR golf game click here or the big yellow button below. 1. Get Creative With Where You Practice. His local course had no practice area so he had to sneak onto an old discarded tee to do most of his practice. He also used to practice at home in the garden and even in his living room. Needless to say practicing his chipping on the carpet made him extraordinarily unpopular at home and he quickly had to stop so that I wouldn’t break his self-imposed “do not get divorced during the challenge” rule. He also used to get up early and sneak onto the local council owned pitch and putt course which is quite near his home. Like a naughty teenager he used to “scarper” whenever the council van would arrive to open up the facility. But this was a great way to get in some practice without annoying either his wife or business partners since everyone else was still asleep! So don’t make excuses about why you can’t practice your short game – get creative and find places to do it. 2. “Play”. Have fun, “muck about”, do silly shots. John spent most of his time challenging himself with all sorts of daft wee games like hitting perfect lobs shots with his 6 iron or using his lob wedge as a chipping club. He would try to do huge high lobs that he could then run underneath and catch the ball. He would have competitions to see how many balls in a row he could chip into his ball bag or if he could play billiards with the balls that were lying on the grass in front of me. He would challenge himself to hit balls out of divots or on rock hard lies – anything to test himself and remove the monotony of standard practice. When he played like this it taught him a huge level of creativity which stood him in great stead when he went back out onto the course. It also dramatically increased his confidence when he was faced with a tricky lie or an awkward stance and really needed to get an “up and down”. But best of all it made practice a fun and enjoyable thing to do. Try it! This is another area where John’s advice goes against the general theories out there. The general theory of chipping is to vary the clubs you use so that you get the ball a metre or so onto the green and let it roll to the pin. But one of John’s key concepts during the year was NOT to overcomplicate the game. So John wanted to have one club that he would use for chipping. That club for John was a 9 iron. That meant he could practice until he was blue in the face and learn exactly how much roll to expect from that club in different situations. So he would remove variables and keep it simple. Additionally, John used three clubs in and around the green 99% of the time. 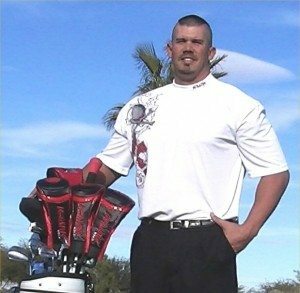 His 56* SW for classic pitching shots, his 60* lob wedge for getting over difficult obstacles with a short landing area and his 9 iron for chipping. The 52* Gap Wedge and standard Pitching wedge stayed firmly in John’s bag and all of his practice revolved around the three club mentioned above. Much of John’s golf success centred around all sorts of slightly daft mind control techniques, visualisation and weird NLP concepts like modelling and anchoring but he always left this creative side behind at the end of a session and took score. You must, must, must keep track of your progress and have proper empirical evidence as to what is actually working for you and what isn’t. You can read all the golf literature you want, watch all the videos and even kid yourself that certain things are working for you but unless you have the figures to back it up very often this is just self-delusion. And golf is filled with self-delusion so make it a rule to avoid it and you’ll be doing yourself a huge favour. For John that meant lots of hard evidence as to exactly how well he was progressing and exactly what type of club or shot would get me closer to the hole. Most pros would always advise that you “chip” the ball with a low lofted club and a straight arm technique when you are close to the hole. It’s easy to take what these guys say as gospel but for John that was wrong. And he has the evidence to prove it in his little black practice books. He would consistently get the ball closer to the hole pitching with his sand wedge. So keep score and make sure you don’t take anything that anyone else says about your game as the truth until you have accurately tested it.